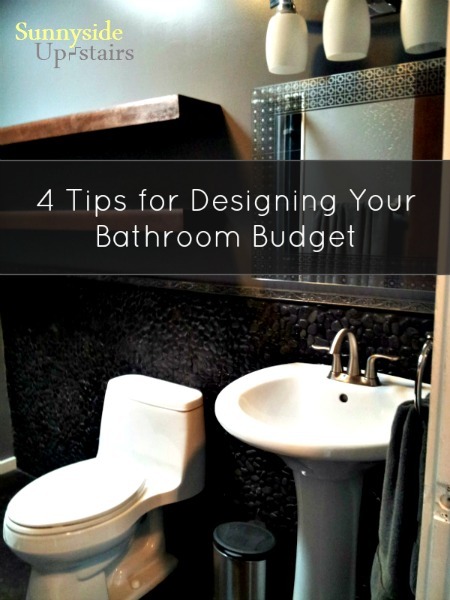 Gutting our bathroom gave my husband and I an opportunity to design the bathroom we wanted from the start. We created our dream apartment bathroom and spent under our budget of $2,500 in brand new products and material. 1. Splurge on the Permanent: Spend more on quality fixtures you love. All things can and will change, but some fixtures in your bathroom are considered "permanent" if it takes a form of demolition to remove. Fine examples of this may be flooring, walls, tile, and large fixtures like a bathtub or shower. In other words, if it will be painful to remove, let's consider it permanent. We decided to save ourselves heartache and put aside money to splurge on the items that we wouldn't want to demolish within the next 15-25 years because it would be worthwhile to pay a little more upfront if it stays put. It lit my husband's face with a smile and the glimmer of possibility. He asked if we could stretch our budget to have it and I found myself joking about Scotty beaming us up until it colonized my mind too. Is this a good and fair investment item? In terms of our toilet, we looked for water saving technology and virtually clog-free technology to save on repairs and water usage for years to come. I also consider the lifetime formula for determining purchase cost per year. For example, this toilet cost $300. We needed to be comfortable with the cost per year at 5 years before being hopeful about the cost at 20 years. $60 a year to us is relative to our Hawai'i phone and internet bill for one month, so we agreed that this was a fair investment. Now, you may want to weigh the cost of a temporary purchase against your investment item. Let's say you want to get an $80 toilet for now. It has everything you need, it's cheaper, and you plan to switch it out in 5 years. The lifetime formula for this toilet is based on how long you'll keep it before you replace it. For example, let's consider a temporary toilet for $80. In these two examples, the lifetime value of having a cheaper toilet for 5 years is about on par with having a more expensive toilet and keeping it for 20 years. No one can predict the future, or predict how long something will last with certainty, but applying a lifetime cost per year formula for how long you expect to keep something can help you decide if something is a fair and worthwhile investment. As a permanent fixture, will this item bring resale value to your home compared to another fixture? We initially considered renting out the apartment for a couple of years to gain the cost of remodeling back, so we kept an open mind from the beginning that this might not be our space for the long haul. We've since decided to put down roots here, but we keep an open mind about the certainty of change. As such, we weighed our choices based on reviews, technologies, and social value. In the end, the question we asked ourselves is: Will someone else be drawn to this space because of the fixtures featured in it? Are you going to look at the item every day and regret not making the purchase you really wanted? Keeping in mind how much we really could afford, we knew the difference between an $80 toilet and a $300 toilet was not so stark that it would be unattainable. There would be ways to make up for the $220 difference that could balance out how much we could spend, and we would be free of guilty self-doubt on the side of "Did I just really buy something that pricey?" The final permanent fixtures we decided on were tile. I consider tile always as a permanent fixture because it is essentially glued to a surface and grouted in place, making it difficult to remove. Tile has the potential to last my entire lifetime, so we wanted to be absolutely sure about our tile choice. We loved the pebbles and wanted to see them every day for the tune of $13 a square foot x 31 tile, or $403 (without tax) for covering an 8 ft. x 4 ft. accent wall, less 1 tile that couldn't squeeze behind the toilet. Adding up our splurge items roughly, $800 + $300 + $400, we decided we needed to spend at least $1,500. These are all very well thought out selections, and look beautiful. I'm loving the black pebble tile! It really doesn't sound expensive when you think about it like that - you are going to be seeing these items for years and the cost over that much time isn't a lot at all. For $2500 of cash and all your sweat equity, you've really made a valuable investment in your home. I've seen some home shows where they spent more than your entire bathroom, just on the shower hardware ($6,000 for the shower head and faucets, I couldn't believe it!) I'm so looking forward to seeing all the tips! Well done! Thank you, Joanne. 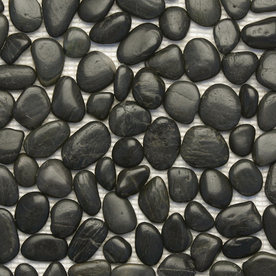 :) The black pebble tile backsplash is one of the things that makes the room for me. When we were buying everything, I had a strong feeling of guilt for spending what seemed like was more than necessary, but once the bathroom was complete, I've not regretted our decisions. It's not the most beautiful bathroom to everyone, but it is to us, and it makes me pleased as punch to see it everyday! I am impressed. We spent a lot on our bathroom remodel. I am jealous of your shower it looks wonderful! And those pebbles – to die for!